The Stronghold of Player Safety is an accompaniment to the popular Stronghold of Security dungeon. It has two floors that are packed with strong, mighty monsters that are available for you to kill. Everyone is free to have fun, and train on the monsters that are located in this dungeon. Also, when entering the dungeon you receive the "Safety in Numbers" music track. 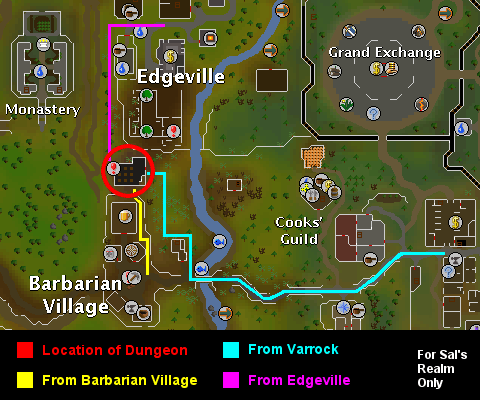 The dungeon is located just north of Barbarian Village and just south of Edgeville under the Misthalin Training Centre of Excellence. The entrance to the dungeon is a secret tunnel behind a poster which is inside a goblin prison cell. The dungeon is accessible after taking the Stronghold of Player Safety Test. Enter the Stronghold of Player Safety through the coal shoot behind the building and talk to the Guard by the stairway. He'll have you read each of the plaques that are outside of the convicted goblins' prison cells. The plaques describe the individual crimes the goblins committed. Then go up the stairs by the Guard. Talk to Professor Henry and agree to take the Stronghold of Player Safety Test. The answers to the test are below, with the correct answer to each question italicized. A player has just asked you for your personal details, including your phone number, home address and email address. What should you do? A player has started to ask you personal questions that make you feel uncomfortable and you'd rather not answer. What should you do? B: Do not answer any questions and report the player using the Report Abuse button at the bottom of the game screen. How do you report a player for breaking the Rules? A friend you met in RuneScape has asked to meet you in real life. What do you do? A: Meet them. They've been a friend in-game for a while now and they're really nice. B: Say no and do not meet them. How long should you play RuneScape for at any one time? B: I should take regular breaks in order to stay healthy. You are approached in the game by a player named JagMod999. 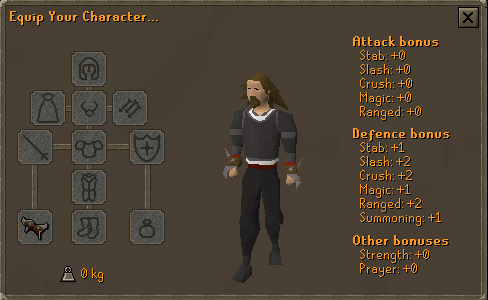 This player claims to be a member of Jagex and asks for your personal details. What should you do? A: Do not answer any questions and report the player using the Report Abuse button at the bottom of the game screen. B: Give them my details; they are a member of Jagex after all. 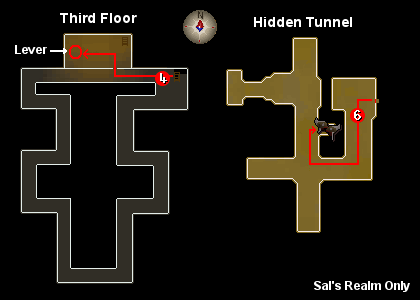 Where should you go in order to read about playing RuneScape safely? A: There is nowhere to go. B: To the 'Safety & Security' section of the RuneScape homepage. A player that you do not know sends you a private message that is offensive. What should you do? You are asked for your full name and date of birth by a player that you have been chatting with for a short while. Should you give them these details? A: No. the player could use my information to steal my identity. I don't want anyone pretending to be me. B: Yes. There's no harm in telling someone my full name and my birthday. Maybe they want to buy me a birthday present. 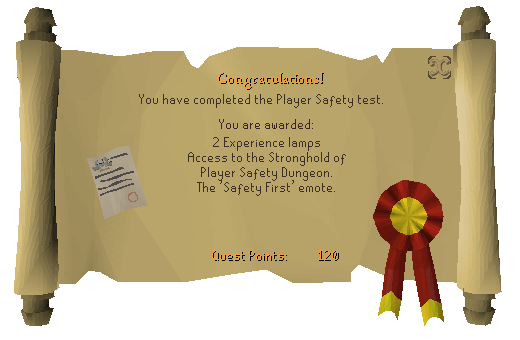 Return the test paper to Professor Henry and you should earn the "Safety First" emote, along with two antique lamps in which grant experience points to a skill of your choice. Enter the dungeon through the poster on the wall of the empty prison cell. You will then be on the second floor of the dungeon and you should see a band of muggers (level 6) You can continue your way across the channel of rooms and follow a balcony which then leads onto the cockroach drones (level 8.) To continue onto different monsters, you will have to go down the flight of stairs which are located at the center of the balcony. The ground level is full of cockroach drones (level 8) and cockroach workers (level 56.) Cockroach workers are larger in size than the cockroach drones and are good experience for medium-leveled players. Along the ground level are cells in which cockroaches inhabit. If you go up the flight of stairs on the opposing side of where you first entered, you will come across more cockroach drones (level 8.) This opposing side is larger and has larger rooms than the side you were previously on. If you go deep into these rooms you may encounter cockroach drones (level 8), cockroach workers (level 56), or cockroach soldiers (level 83) These rooms are the only place where cockroach soldiers are located, and cockroach soldiers are the biggest and toughest of the cockroaches that inhabit the Stronghold of Player Safety dungeon. The third level of the dungeon is practically a balcony. On the top floor, you can encounter cockroach workers and cockroach soldiers. 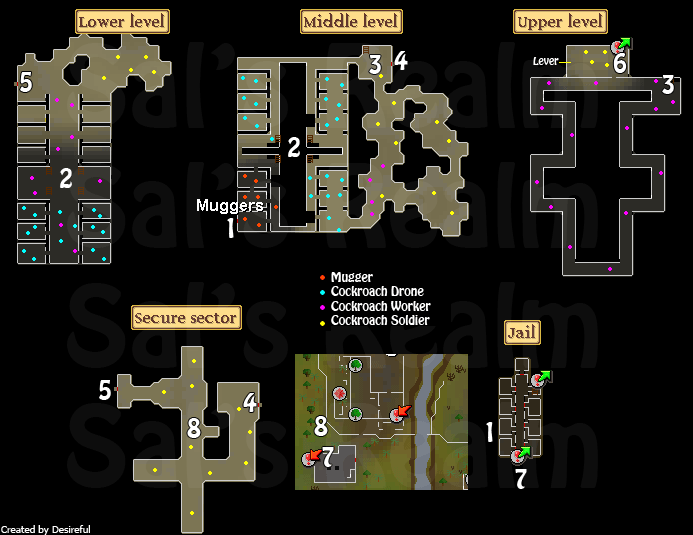 If the thought of exterminating giant cockroaches or ensuring that you know how to be a safe and responsible Runescape player is not enough to lure you into the stronghold there is 10k in gold pieces and the Stronghold of Player Safety Gloves there for the taking! 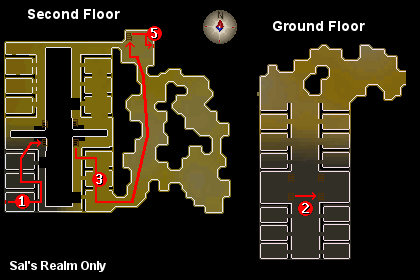 After entering the dungeon through the poster go down the closest stairs towards the north. Go straight east across the ground floor and go up the stairs back up to the second floor. Head south, around the corner to head back north, and go up the northern stairs. Go into the room towards the northwest and pull the Old Lever. Then go back down the stairs you came up. Back on the second floor, go through the Jail Cell door on the east wall by the stairway to enter the Hidden Tunnel. Head south, around the corner back towards the north and the chest is in a little alcove on the east side. 2 Antique Lamps giving 500 experience each to a skill of your choice when used.